Quick sidebar before we get into the book club today. When was the last time you put yourself in a position where you weren’t the most accomplished person in the room? If you’ve read through Holy Hustle already, you’ll know that I’m really, really uncomfortable in those situations. If there is a chance I can fail, I usually bail. But sometimes God has me say “yes” to something and keeps all the information that would make me nervous to Himself. When I spoke at the She Conference a few weeks ago, I had no idea that I was going to be, without a doubt, the least accomplished, talented person to grace their stage. I followed absolutely amazing women who blew me away with their messages…and I was right before lunch, which is always a tough spot for a speaker like me, who will likely never be the most animated, outgoing person. It’s not how God created me. To be honest, it was hard for me to go on stage, knowing that I could never measure up to what any of those sweet women had just experienced. But by the grace of God, I stood there…and said some things….I could honestly not tell you what, but it had something to do with being a light 😉 It was a bit of a blur…and before I knew it, before I was even halfway through all the things I WANTED to say, I spotted the keyboard player from their worship team on stage, gently playing to indicate that my time was up. But I had time to say something important. I honored the other speakers for their talent, their messages, the way they allowed the Holy Spirit to use them. I could have been jealous, or competitive, but that’s not what holy hustle has been teaching me, and I have to walk what I’ve written. 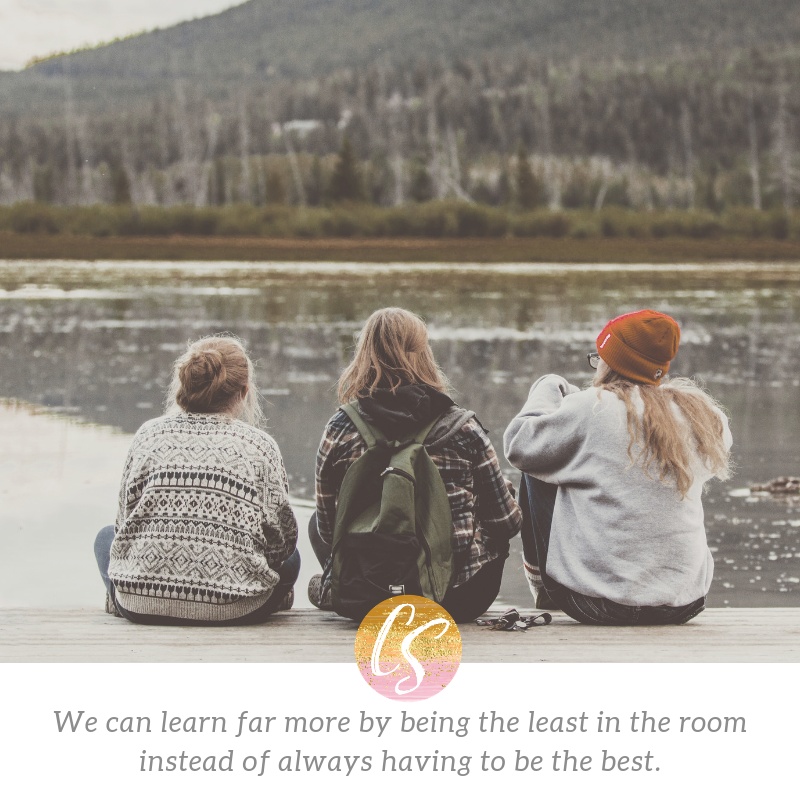 The truth is, I learned more from those other speakers by being the least in the room than I ever could have by being the best. I soaked in their wisdom and kindness and appreciated their prayers in a way that made it a delight – not a burden – to be away from my family for a few days. It may still be years and years before I’m as confident and equipped as they were, if God allows, but I know now that I have SO much to learn. And I’m excited to get started. So, next time you have the opportunity to do something out of your comfort zone – the kind of thing that would normally send you running – consider saying “yes.” Be the least accomplished person in the room and be willing to learn from others. And spend some time honoring them, instead of competing with them. Ok…sidebar over. Let’s get on to this book club! We’re chatting about Ruth in this section, and more importantly, what it might look like to be willing to hustle on the fringes instead of waiting for the big arenas or platforms. If you could identify just one talent that you have, and one small way that you could use it this week, what would it be? What would you do? As we head into Thanksgiving, how can you spend some time focusing each day on the small blessings God has for you,? How can a focus on the small moments help you navigate the let down of unrealistic expectations we have for the holiday? Are there any things about the holidays – loneliness, family, etc – that keep you from living in that space of holy hustle? There is a lot I could quote in this chapter, but with the holidays approaching I want to focus on this: We don’t need to hold positions of great power or authority to use where we are and what we have to be a voice for those who have none or defend the needy in our neighborhoods and communities. I know studying Proverbs 31 can be problematic for some of us, when we feel like it’s been used in the past to make us feel like we don’t do enough, or we can never measure up. Hopefully as we went through this this section you found some encouragement in studying who she was – and the connection to the verses before her story to speak up, judge righteously, and defend the cause of the oppressed and needy. We don’t need to do it all – we just need, like the Proverbs 31 woman – to focus on our own homes, the tasks God is giving US to do, and to do them to the best of our abilities. How does knowing that serving well doesn’t come from will power, but from God’s power in us, help you to focus on the tasks God has given you? Kate shared that Psalm 23 is the verse she turns to as a reminder to keep her hustle holy – what verse do you turn to? This chapter alone should explain that little bonus blog post at the beginning of our time today. It’s so easy for us to get caught up in comparison, but we can learn to do it better. We can learn to acknowledge the amazing ways that God made other women, come alongside them to encourage them, and invite them into our own work so that we can do even more for God’s kingdom. When we think of the results of our work like that – as something we get to do for God – we don’t have to be afraid of what might happen if we share our space with someone else. We each have something wonderful to contribute, and what a delight it could be to show the world what it can look like when talented women work together in confidence, peace, and love. Who is one person you’ve been afraid to include in your work because they make you doubt your worth? What is one small thing you can do this week to outdo someone in honor? When you stop to really think about it, what makes you afraid to collaborate with others? What would be the worst thing that would happen if it didn’t work out the way you planned? Alright, my holy hustlers. We’ll take a break from our book club time together next week so we can celebrate Thanksgiving. Know that I am so grateful for you – for the messages you send me about the way God has used this message in your lives, for your courage to join me on this journey, and for you encouragement to keep going after the next thing God has for me. Be brave, my friends, and carve out some time next week to spend with God and give all those holiday expectations over to Him. I can’t wait to hear about the small, every day, ordinary blessings you notice. Chapter 5: If you could identify just one talent that you have, and one small way that you could use it this week, what would it be? What would you do? I’ve been told I’m a good listener, and I think one thing I can do for my in-laws and aunt is to take time away from my writing to just listen to them. As we head into Thanksgiving, how can you spend some time focusing each day on the small blessings God has for you? I joined a gratitude challenge. How can a focus on the small moments help you navigate the let down of unrealistic expectations we have for the holiday? I learned years ago that my in-laws do holidays at a much slower pace than I was brought up. Just enjoying the special time together and the special foods prepared outweigh any traditions we might expect. Are there any things about the holidays – loneliness, family, etc – that keep you from living in that space of holy hustle? This year it’s NaNoWriMo. I’m behind already and don’t want to have to take an extra day off. Chapter 6: How does knowing that serving well doesn’t come from will power, but from God’s power in us, help you to focus on the tasks God has given you? There are many different ways to serve. I don’t have to do it up big and bustly like Martha or the Proverbs 31 woman. I just need to gratefully give my gifts back to the Lord and use them how He wants me to be a part of the Body of Christ. Chapter 7: Who is one person you’ve been afraid to include in your work because they make you doubt your worth? I feel unworthy to a lot of people, but they can’t be really included in my work, because I’m the only one who can be a mother to my kids, wife to my husband, and writer on my blog. What is one small thing you can do this week to outdo someone in honor? I’ve been trying to honor people in my life through my gratitude challenge #storybystory. When you stop to really think about it, what makes you afraid to collaborate with others? What would be the worst thing that would happen if it didn’t work out the way you planned? I’m afraid I will get the short end of the stick, be taken advantage of. People–even other Christians–tend to take advantage of people-pleasers and of us who tried to put others first. I also am afraid of not being appreciated, of my time and effort not being valued.